During the plunder, ghettoisation and deportation of the Hungarian Jews, the main role was played by the Hungarian authorities. The orders of the government collaborating with the occupying German Nazis were carried out by the police , the gendarmerie and the public administration , generally mercilessly. Especially the gendarmerie distinguished itself with its brutality and cruelty. Occasionally, however, a few gendarmes tried to help the persecutees. In accordance with survivor testimonies, there were but few instances where gendarmes displayed kindness and humanity toward the Jews during the ghettoisation. As D. J. recalls, the gendarmes in Enying behaved decently. Later, in the Sárvár internment camp some gendarmes even offered to smuggle out letters. "The gendarmes were very decent here as well." In Csicser next to Ungvár, S. I. met only one gendarme "who behaved as a human being", called Nagy. were allowed to take all their belongings and were allowed to do shopping every noon so they could feed themselves. Mrs. Géza Hajdú, born Erzsébet Szilárd, described the gendarmes in the Kaposvár ghetto as follows: "Some were willing to smuggle food and letters, while others were cruel and brutal." Arriving at the temporary camp at Nyírjespuszta, Jews from Balassagyarmat and the surrounding region found that "in the first few days the rank and file among the gendarmes were cruel but later gendarme Major Tamássy, the commander of the local gendarme detail, forbade his men to mistreat people, so in a few days conditions were much improved." 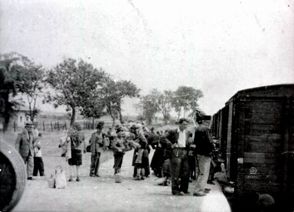 The DEGOB protocols also document isolated cases demonstrating that some members of the gendarmerie tried to help the Jews during the deportation as well. 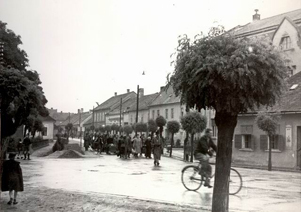 During the evacuation of the Nyírjespuszta camp mentioned above, Jewish leaders asked police officer Oszkár Óriás in vain to load sufficient supplies of water into each car. "Overhearing the conversation, gendarmerie Lieutenant Colonel Korpánszky berated the police officer and gave orders to immediately carry water into the cars. The rank and file gendarmes wanted to order Jews to get water, but eventually peasants were called in and they were made to fetch water." G. A. could consider himself lucky as there were only 54 people in his cattle car, while nearby another had 101 people crammed in. At the deportation of the Huszt ghetto Mrs. B. L., pregnant at the time, was locked in a wagon with 70 people, three other pregnant women among them. "At Királyháza a gendarme sergeant called István Kulcsár rescued the four of us. He already planned to take us from the Huszt ghetto, but there he failed. The train stopped for a long time at Királyháza, so he could organize our escape. He followed the train on a bicycle all the way to the Királyháza station ...He did not ask for any money, which we could not have given anyway - we were all poor." Sergeant Kulcsár's perseverance and bravery saved the lives of four women and four unborn children. He was not acquainted with any of them, and he acted without hope for a reward. Of course, Hungarian Jews encountered - as rare examples - well meaning gendarmes also during the Arrow Cross era. B. K. and R. M., deported in December 1944, recounted the following events. "The gendarmes threw snow [snow into the car] and we licked it." Another survivor, Miklós Kellner, testified that thanks to a pass from the Swedish Red Cross, he was returned to Budapest from the border. "At that incident gendarme Captain Árpád Kalotay offered his assistance; and he rescued three women as well." At Sárvár, a gendarme warrant officer was ordered to hand over Jews to the Arrow Cross. "A gendarme major came over and asked him: ‘What do you want to do with these unfortunates'? The warrant officer said something in a whisper, and the major asked: ‘Do you have an order for that'? You don't. So nothing will come of your plan, I will make sure of that'. ... Subsequently, we were led down to the river Rába, the first row was made to line up six steps, the second three steps behind, all our belongings were confiscated and ordered us to hand over our rucksacks as well. The gendarme major intervened and saved us; mass execution would certainly have followed," recalled Imre Galambos, describing his escape. was the commander of the Csillaghegy ghetto. Within the walls of the ghetto, he gave free reign to the free-elected Council of Five that discharged its administrative duties as an autonomous local government. "Gendarmes were not allowed to enter or take any measures within the ghetto." "On June 29 Master Sergeant László Endre appeared in the ghetto and asked for the documents of mixed-marriage couples, saying that come what may, he would keep these people in the ghetto. ... [The next day] before departure Endre came over and asked people in mixed marriages to step out and go back to the ghetto until further instructions. Eleven people returned in this way ...At the last minute two families escaped; Endre was aware of this and, in fact, he recommended others to do the same. The eleven of us remained in the ghetto for about six weeks before returning to our families." At Csillaghegy, preparations for deportation were conducted in an exemplary fashion: Endre gave strict orders that men be searched by gendarmes in the presence of two municipal jurors to prevent any atrocities. Women were searched exclusively by women guards, no gendarmes or other men were allowed to be present. The night before the deportation, Endre left the ghetto unguarded and informed his Jewish acquaintances about this. "Three persons left the ghetto that night." death marches in November, he lifted people form the columns under pretext of examining their papers, he provided fugitives forged documents, and organized and covered for the escape of labour servicemen. A family man with three children, he sheltered several Jews in hiding, risking his own life and the lives of his family members. He also protected from the Gestapo the local operatives of the Social Democratic party and residents of the Polish refugee camp. In December 1944 the Arrow Cross was already hunting him, but he fled with the majority of his protégés. 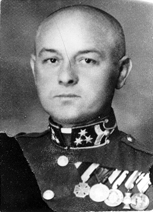 Some four hundred Hungarian and Polish Jews and Polish refugees owed their lives to gendarmerie Master Sergeant László Endre. Yet no plaque commemorates his name to this day. F. B. 's recollections. Protocol 628. For a detailed story of Gendarme Master Sergeant Endre, see Vági, 1998. Zoltán Vági: A másik Endre László - Csillaghegyi csendőrtörténet. (The Other László Endre. A Gendarme Story from Csillaghegy.) Remény. December, 1998. pp. 47-53.